The PolyPropylene – PP filter cartridge Housing is made of ruffed reinforced polypropylene. They are suggested for low flow rates to higher flow rates in extensive range of applications including residential, business and industrial sectors. Available in 8″, 10″, 20″ Standard models and 10″, 20″ Jumbo models for higher flow rates. Optional Pressure of PP Filter Cartridge Housing – relief/bleed button on inlet side of cap. Thick walls for increased strength. 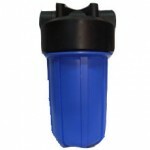 Available with clear SAN – Styrene Acrylonitile / Polycarbonate – PC and opaque (Blue – Black) models All Housing have been tested and passed the hydrostatic leak and burst pressure to ensure consistence safe performance. Clear Body (SAN/PC) with White Cap. Pressure relief / bleed button on inlet / outlet side of cap.